Qari Zainuddin Mehsud, a rival commander of top Taliban militant Baitullah Mehsud, was killed on early Tuesday morning in a mosque in Dera Ismail Khan.Qari had recently switched over to the Pakistani army and declared his support for its current campaign against Baitullah.A gunman shot dead Qari while he was sleeping in his room after offering morning prayers, the police said. At least seven persons were killed and more than 70 injured when a Metro train crashed into another in Washington on Monday evening. 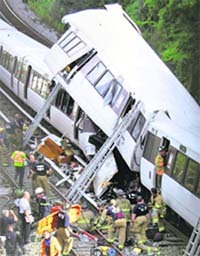 The rush-hour accident is the deadliest in the history of Washington's public transit system.One of the trains involved in the crash smashed into the other stationary train on Metro's Red Line between Fort Totten and Takoma Park, on the border with Maryland. Asking India to reciprocate “positively” to its probe into the Mumbai terror attacks, Pakistan today said it would send more queries to New Delhi seeking additional information on the 26/11 strikes blamed on the LeT in order to move forward its investigation. Iran’s top election body today ruled out cancelling the disputed presidential vote as the world voiced increasing alarm at the violent crackdown on opposition demonstrators posing the most serious challenge to the Islamic regime in 30 years. Daughter of a Punjabi Sikh immigrant from Amritsar, Namrata “Nikki” Randhawa Haley, is another Bobby Jindal in the making.Nikki, 37, as she is popularly known, has announced her candidacy for Republican Party nomination for the Governor of South Carolina, which will go to poll next year. US President Barack Obama’s National Security Adviser James Jones will visit New Delhi as part of ongoing US “effort to further deepen and strengthen our key bilateral partnership with India”. Over 90 persons, most of them militants, were today killed in air strikes by Pakistani jet fighters and two missile attacks by US drones in South Waziristan , stronghold of Baitullah Mehsud. Qari Zainuddin Mehsud, a rival commander of top Taliban militant Baitullah Mehsud, was killed on early Tuesday morning in a mosque in Dera Ismail Khan.Qari had recently switched over to the Pakistani army and declared his support for its current campaign against Baitullah. Islamabad: The Swat operation is in its final stage and an intensive exercise has been completed for pre-positioning forces and equipment in South Waziristan to launch a decisive action against Tehrik-i-Taliban Pakistan (TTP) chief Baitullah Mehsood and his network, army spokesman Maj-Gen Athar Abbas has said.However, he refuted interior minister Rehman Malik’s claim that top militant leader of Swat, Maulna Fazlullah, is injured and trapped. The minister’s claim hit headlines in major newspapers on Tuesday. Abbas said there is no information on Fazlullah but added that troops are looking for him. Meanwhile, Prime Minister Yousaf Raza also said the army has been able to eliminate “second and third tier” leadership of the militants. "But their top leaders are quiet and we will soon know whether they are alive or not,” he added The PM said he could not give any specific date when the operation will conclude. A gunman shot dead Qari while he was sleeping in his room after offering morning prayers, the police said. While no group claimed responsibility, Qari's close aide Baz Mohammad, who was wounded during the attack, identified the assailant as Gulbadeen Mehsud. Dr Mahmud Jan of the local government hospital said some unknown people brought Qari Zain and Baz Mohammad in a van. He found that Qari had bullet wounds on his head and other parts of the body. "I declared him dead at which the strangers sped away along with his body and left Baz Mohammad in the hospital," said the doctor. Qari was leading the Taliban group since the murder of its leader and Baitullah's brother, Abdullah Mehsud. The group has been active inside Afghanistan against the US and NATO forces. Baitullah last year dissociated himself from the group and formed his own Tehrike Taliban Pakistan (TTP). He established links with the Al-Qaida and other militants, who carried out terrorist attacks in Pakistani cities. In a swift reaction, army gunships fired missiles in a Waziristan village suspected to be a hideout of Baitullah. Six people were killed in the attack. Last week Qari had declared war against Baitullah and offered to cooperate with the Pakistani army in its hunt against the TTP chief. In a series of interviews, apparently sponsored by security agencies, Qari had accused Baitullah of indulging in un-Islamic fight against an Islamic state and committing terrorist acts at the behest of some foreign powers. Baitullah's group, on the other hand, had dubbed Qari as an ISI agent. Qari Zain had also launched a concerted drive to enlist support from members of the Mehsud tribe. A lot many Mehsud tribesmen were coming to Qari to join the fight against Baitullah. "Gulbadeen, who killed Qari, also posed as the new recruit in Qari's group and entered the mosque without hindrance. Qari was sleeping in his room when Gulbadeen sprayed bullets to kill Qari," Baz Mohammad told reporters in D. I. Khan hospital. While the army claimed to have tightened the noose around Baitullah in recent weeks with the resolve to kill or capture him, Bailtullah's men have targeted those they suspect to be working for the army. So far, 250 such people have been killed during the past few months. At least seven persons were killed and more than 70 injured when a Metro train crashed into another in Washington on Monday evening. The rush-hour accident is the deadliest in the history of Washington's public transit system. One of the trains involved in the crash smashed into the other stationary train on Metro's Red Line between Fort Totten and Takoma Park, on the border with Maryland. The force of the crash caused the moving train to vault over the stationary one, which was awaiting permission to enter the station at the time of the crash. The female operator of the moving train was among those killed in the crash. Washington Mayor Adrian M. Fenty told reporters on Monday evening that rescue personnel were combing the wreckage. "It looks to be the worst Metro accident in DC history,” Fenty said. He described the scene of the crash as "as horrific as you can imagine... One car was almost squeezed completely together." One train car was perched atop part of the second train in a mass of twisted metal and smashed seats. Seventy people were treated at the scene of the crash. Of those, 56 had minor injuries, over 12 had moderate injuries and two people had life-threatening injuries, according to Chief Dennis Rubin of the Washington's Fire and Emergency Medical Services Department. President Barack Obama said his family's "thoughts and prayers go out to the families and friends affected by this tragedy." He said the White House staff was in touch with Fenty and would continue to monitor the situation. The cause of the crash was unknown. The National Transportation Safety Board will investigate the crash. Metro general manager John Catoe said the department's "safety officials are investigating, and will continue to investigate until we determine why this happened ”. “In order to proceed further (in the probe into the Mumbai attacks), we will send more queries to India,” Interior Minister Rehman Malik told reporters outside Parliament. The Pakistan government is ready to extend “unconditional cooperation” to India to investigate the Mumbai attacks, he said. “However, India would have to reciprocate our efforts by adopting a positive stance,” he added. India initially provided the confessional statement of Ajmal Amir Kasab, the lone Pakistani terrorist captured during the attacks in Marathi and this held up the probe, Malik said. The translated version of the statement was subsequently provided by New Delhi and authorities are examining it. Malik also said Pakistan had arrested five of the accused and declared 13 others as proclaimed offenders. Eleven handlers, who helped terrorists plan the attacks had been identified, he said. Malik, too, referred to the apparent link between the two attacks during an interaction with the reporters yesterday. “We believe that there is a link between the two incidents because investigations conducted by some foreign agencies also hint the same”. He had then described the information provided by India as insufficient and said it could not be used to take action against the alleged perpetrators of the Mumbai attacks. ‘Dawn’ newspaper quoted its sources in the Interior Ministry as claiming that last year's Mumbai attacks and the 2007 bombing of the Samjhauta Express train were linked. This was one of the reasons why Pakistan would send another dossier to India seeking more information about the Mumbai attacks, the sources claimed. “In the recent presidential election we witnessed no major fraud or breach,” Guardians Council spokesman Abbasali Kadkhodai was quoted as saying by English-language state television Press TV. “Therefore, there is no possibility of an annulment taking place,” it added. The opposition has been staging almost daily protest rallies, alleging fraud and widespread irregularities in the June 12 election that returned hardline President Mahmoud Ahmadinejad to power for another four years. World leaders are calling for an immediate halt to state violence against the protesters, with state media reporting that at least 17 persons were killed and many more wounded in the unrest that has convulsed the nation for 11 days. The streets of Tehran remained tense today, the day after hundreds of riot police armed with steel clubs and firing tear gas, many riding on motorbikes, broke up an opposition rally of about 1,000 people. Demonstrators had gathered in a Tehran square in defiance of the Revolutionary Guards, the elite force set up in the wake of the 1979 revolution, which warned of a “decisive and revolutionary” riposte to protests. UN chief Ban Ki-moon voiced growing concern about the violence and urged “an immediate stop to the arrests, threats and use of force”. He appealed to the government and the opposition “to resolve peacefully their differences through dialogue and legal means”. The White House bemoaned the lack of “justice” in Iran, and said scenes of demonstrators, especially women, braving the repression, had moved President Barack Obama. Some European governments have begun urging nationals to avoid travel to Iran. Student unions were planning to stage a protest outside the British embassy in Tehran today but the interior ministry said it was not authorised and it was not clear if the demonstration would go ahead. Iran has singled out Britain, as well as the United States, as one of the leading instigators of what it says is foreign “meddling” in the post election chaos. Daughter of a Punjabi Sikh immigrant from Amritsar, Namrata “Nikki” Randhawa Haley, is another Bobby Jindal in the making. Nikki, 37, as she is popularly known, has announced her candidacy for Republican Party nomination for the Governor of South Carolina, which will go to poll next year. Presently, she is a member of the South Carolina House of Representatives. Jones would visit New Delhi at the invitation of his counterpart, National Security Adviser MK Narayanan, after visiting Afghanistan and Pakistan to monitor implementation of the new US war plan, National Security Council spokesman Mike Hammer announced yesterday. “At the request of the President, Jones is travelling to Afghanistan and Pakistan to follow-up on the implementation of our new, comprehensive strategy,” a release said. Over 50 persons were killed when a US drone targeted a gathering offering funeral prayers for six militants who died earlier in the day in another attack.